Gloomy weather settled over Simi Valley on Monday as the family and friends of Juan C. Venegas, a casualty of the war in Iraq, trickled past his tearful fiancee on their way into St. Rose of Lima Church. PHOTO CAPTION: Joseph A. Garcia / Star staff. As the service begins at St. Rose of Lima Church, a flag-draped coffin flanked by six pallbearers, each a member of Lance Cpl. Venegas' Marine battalion, makes its way to the altar. Heart-wrenching liturgy and song, sung in Spanish by Belen Quezada, rang through the church as row after row filled with mourners dressed in black. 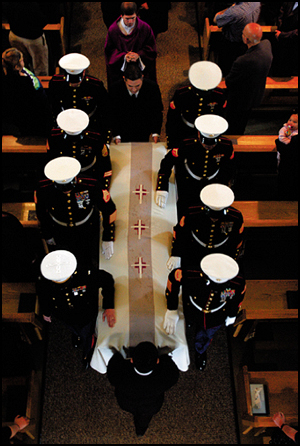 As the service began, a flag-draped coffin flanked by pallbearers, each a member of Lance Cpl. Venegas' Marine battalion, slowly made its way toward the altar. Venegas, 21, died April 7 in a vehicle accident in Anbar province. In the church lobby, boards displayed his photographs. There he was as a young boy opening gifts in front of a Christmas tree, as a friend joking around, and as having found love. One of the photos, identified as "military ball," shows Venegas in uniform embracing fiancee Mariam Khoury, 23, who wears a blue strapless gown. In one of those carnival booth strips of four black-and-white pictures, one on top of the other, the couple goof around in various poses. Her soul mate gone, Khoury looked exhausted Monday and leaned on her father's arm as she headed to the pew. In full dress uniform, Dino Moreno hung around in the lobby, staring at the photos. He was Venegas' platoon sergeant during his first of two tours of duty in Iraq. "He was kind of quiet for the most part," Moreno said. "He was a good guy, always upbeat and willing to do what had to be done." Moreno came to the funeral from Marine Corps Base Camp Pendleton, where he is stationed. Several hundred people attended the Catholic funeral, including military personnel, veterans and members of local law enforcement. Gov. Arnold Schwarzenegger sent California Highway Patrol officers to deliver condolences to Venegas' mother, along with a state flag that had flown at half-staff over the Capitol. "I'm going to miss him a lot," said Venegas' friend Simon Corral, speaking to the gathering from the pulpit. "I'm sure we all will." Chilly temperatures greeted the mourners at Assumption Catholic Cemetery. Mothers wrapped their children in blankets and pulled sweatshirts over their heads. Some brought flowers. A military guard fired three volleys into the air and in the distance, a muted bugle played taps. Venegas was laid to rest just feet from where Army Spc. Michael A. DiRaimondo and Marine Cpl. Christopher A. Gibson are buried. Both died in Iraq, DiRaimondo on Jan. 8, 2004; Gibson on April 17, 2004. Genene Overland, a mortuary staff member, shook her head as she stood outside the ring of mourners. This was the third military burial the cemetery had in the past year, but Overland was not getting used to them. "They're so young," she said. 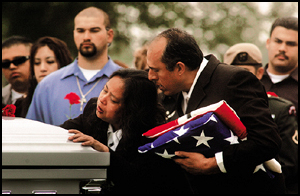 Venegas' funeral was rendered with military honors, with the traditional flag-folding and presentation to his mother, Maria. After the ceremony, she collapsed, sobbing on her son's coffin as the crowd began to disperse. "It's a sad affair," said Wayne Wright, post chaplain of the Veterans of Foreign Wars post 10049. Venegas is survived by his mother, his father, Juan Venegas, and his sisters, Erica, 19, Katie, 14, Emely, 10, and Brianna, 7. Copyright 2005, Ventura County Star. All Rights Reserved. Juan Venegas, right, tries to console Maria Venegas at the burial of their son, Juan C. Venegas, at Assumption Catholic Cemetery in Simi Valley on Monday.